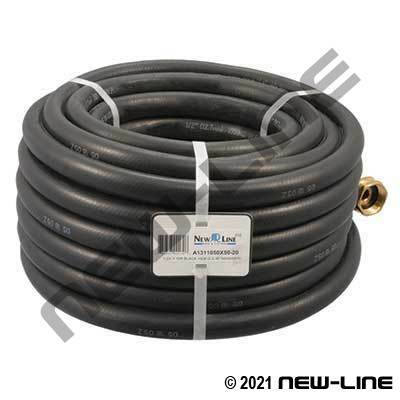 This is a price sensitive, commercial grade utility rubber water hose (NOT for use with air and not for food grade applications) that is used as a washdown/garden hose in construction, rental, and general commercial use where regular abuse such as being driven over or being subject to theft is common. Its rubber construction resists abrasion, however for higher grade EPDM rubber compounds and a hose with better handling/reeling/rolling characteristics refer to our NL1315 Industrial GP/Sureline Water Hose. Typical Fittings: N400-BR Brass or N400-NY nylon barbs (smaller sizes), N505-BR garden hose fittings, camlocks, brass FBL ferrules, N66 pinch clamps. Construction: Tube: Black, smooth EPDM. Cover: Smooth EPDM. Reinforcement: Synthetic cords.